One of Australia’s most innovative filmmakers, Amiel Courtin-Wilson, captures two legends – free jazz pioneer Cecil Taylor and modern dance artist Min Tanaka – in an intimate performance piece like no other. Considered one of the architects of 20th century free jazz alongside the likes of John Coltrane and Ornette Coleman, Cecil Taylor (1929-2018) was a radical improviser who experimented with musical form. 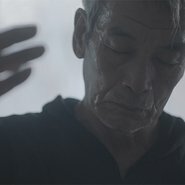 Shot over three days in 2016 at Taylor’s New York home, the film bears witness to an intimate, wordless ballet between Taylor’s improvised music and the movement of legendary Japanese dancer and butoh performer Min Tanaka. For 70 minutes, these two masters riff under the graceful lens of Germain McMicking’s impressionistic photography, inviting the audience to experience a glimpse of the creative process at its most sublime. This screening of The silent eye will be followed by a Q&A session with the film’s director Amiel Courtin-Wilson and Documentary Australia Foundation founder and CEO Mitzi Goldman. Part of a quarterly series of Australian documentary screenings presented by the Gallery and the Documentary Australia Foundation.